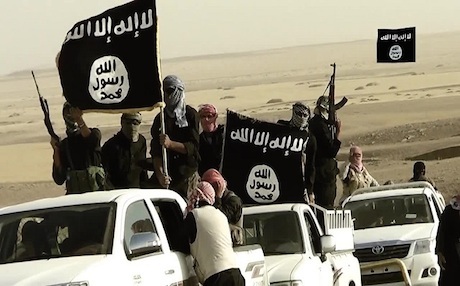 October 9, 2015 (Tony Cartalucci - NEO) - The US Treasury has recently opened an inquiry about the so-called "Islamic State's" (ISIS/ISIL) use of large numbers of brand-new Toyota trucks. The issue has arisen in the wake of Russia's air operations over Syria and growing global suspicion that the US itself has played a key role in arming, funding, and intentionally perpetuating the terrorist army across Syria and Iraq. Toyota says it does not know how ISIS obtained the vehicles and is “supporting” the inquiry led by the Terror Financing unit of the Treasury Department -- part of a broad U.S. effort to prevent Western-made goods from ending up in the hands of the terror group. Not surprisingly, it appears the US Treasury is asking the wrong party. Instead of Toyota, the US Treasury's inquiry should have started next door at the US State Department. 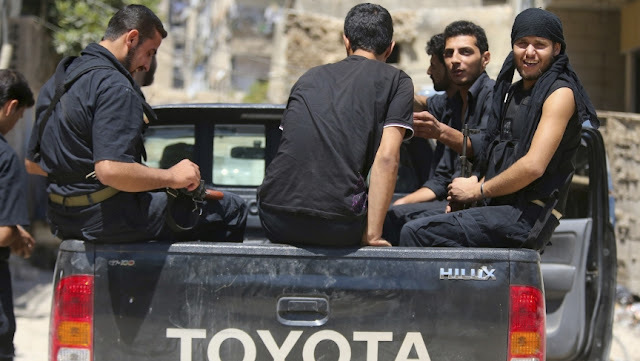 Just last year it was reported that the US State Department had been sending in fleets of specifically Toyota-brand trucks into Syria to whom they claimed was the "Free Syrian Army." "Specific equipment like the Toyota Hiluxes are what we refer to as force enablers for the moderate opposition forces on the ground," he adds. Shahbander says the US-supplied pickups will be delivering troops and supplies into battle. Some of the fleet will even become battlefield weapons.. So far the UK has sent around £8m of “non-lethal” aid, according to official papers seen by The Independent, comprising five 4x4 vehicles with ballistic protection; 20 sets of body armour; four trucks (three 25 tonne, one 20 tonne); six 4x4 SUVs; five non-armoured pick-ups; one recovery vehicle; four fork-lifts; three advanced “resilience kits” for region hubs, designed to rescue people in emergencies; 130 solar powered batteries; around 400 radios; water purification and rubbish collection kits; laptops; VSATs (small satellite systems for data communications) and printers. It's fair to say that whatever pipeline the US State Department and the British government used to supply terrorists in Syria with these trucks was likely used to send additional vehicles before and after these reports were made public. The mystery of how hundreds of identical, brand-new ISIS-owned Toyota trucks have made it into Syria is solved. Not only has the US and British government admitted in the past to supplying them, their military forces and intelligence agencies ply the borders of Turkey, Jordan, and even Iraq where these fleets of trucks must have surely passed on their way to Syria - even if other regional actors supplied them. While previous admissions to supplying the vehicles implicates the West directly, that nothing resembling interdiction operations have been set up along any of these borders implicates the West as complicit with other parties also supplying vehicles to terrorists inside of Syria. Of course, much of this is not new information. So the question remains - why is the US Treasury just now carrying on with this transparent charade? Perhaps those in Washington believe that if the US government is the one asking this obvious question of how ISIS has managed to field such an impressive mechanized army in the middle of the Syrian desert, no one will suspect they had a role in it. Of course, the trucks didn't materialize in Syria. They originated outside of Syria and were brought in, and in great numbers, with the explicit knowledge and/or direct complicity of the US and its regional allies. Asking Toyota where the US State Department's own trucks came from is another indication of just how lost US foreign policy, legitimacy, and credibility has become. Russia's intervention, and what should become a widely supported anti-terror coalition must keep in mind the criminality of the US and its partners when choosing its own partners in efforts to restore security and order across the Middle East and North Africa.